Wednesday – day three of the challenge – was not a good day. I was actually physically sick on Tuesday night, caused, I’m sure, by the quite drastic change in diet between this week and last. Still feeling under the weather on Wednesday morning, I decided to skip breakfast. Not the best idea I’ve ever had. I spent the whole of the morning feeling lightheaded and with my stomach rumbling, and ran home from work for my lunch break 45 minutes earlier than I normally would. It’s amazing how satisfying my bowl of rice, passata, carrots, onions and mushrooms (23p) was after a serious lack of vegetables the previous day. On Wednesday evening, a friend came round to keep me company for a few hours, which was very much appreciated.It was nice to sit and chat with someone who kindly joined me in drinking tap water! 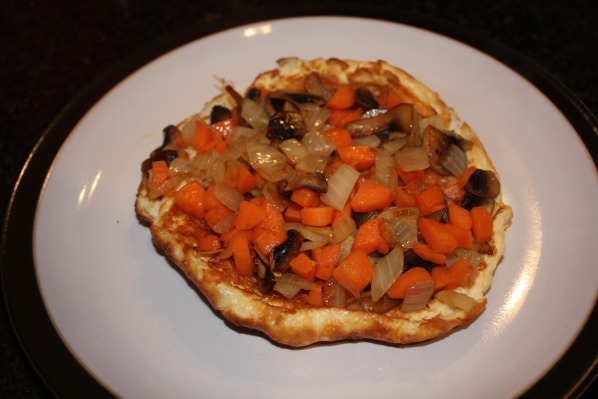 After he left, I tried to satisfy my craving for vegetables by making myself a two-egg omelette topped with carrots, onions and mushrooms (30p) for my dinner. 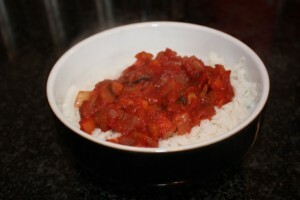 The vegetables went down a treat, but I left over half the omelette – I think I’ve overdosed on eggs slightly this week! I decided to head down to our regular Wednesday night pub quiz later in the evening – the pub landlord knows that I’m taking part in the Live Below The Line challenge, so he didn’t question the pint of tap water that I ordered on arrival. While it was good to get out and see people, it did highlight just how many of mine and my friends’ plans involve food or drink to some extent.